thanks heaps for keeping us informed of what's around in the area by way of suitable property. I think this is an excellent medium to assist genuine people in buying and developing/living in the myoko and other areas and we all need someone over there who can assist in this regard. Perhaps a bit more info in relation to how far the properties are to the lifts by car, or walk or even if they are on or close to the shuttle bus would be very useful, given how hard it is to work out those things from a map. I think most people interested in owning real estate in the area are focussed on the ski resorts and access to them is perhaps one of the main initial points of interest. Do the yearly taxes have any relationship to the age of the building ? Of the recent listings the closest one to the ski areas would be the Bears of the Forest's Pension - about a five minute drive. Walkable, but not something you'd want to do regularly with skis under your arms. The tax thing is a mystery to me. I think it goes on the size of the property but will double check. I've heard a number of property owners just cry poor and refuse to pay them. If anyone is genuinely interested in buying property in the Myoko area. I have actually been down this road a couple of years ago and have several interested parties looking to invest. There is actually a lot of property available in the Myoko (Akakura village area). In consultation with a local builder I have inspected several properties and have town planning maps which identify those parcels of land and buildings available for sale. One thing I will say though is that it is not a good idea to make too much noise about it as Myoko has laid relatively dormant for quite a long time prices are relatively cheap. However as soon as foreign investment is mentioned prices are more often than not jacked up. I am in Myoko from early December and am more than happy for interested parties to contact me. As mentioned earlier, im keen to buy in Myoko or another quality area on a share basis as soon as my house sells. It seems to me if you have 3 people prepared to put in up to AUD$40 000 each, you would get a place capable of supporting all their families for the winter. Certainly people i have talked to are keen but are waiting on me to go over there again and look at these places in the summer. Sharing the costs and dramas would be an advantage also. I have no idea about renting or making money from them, but so long as its not a nightmare accounting wise its a thought as im wanting to live there for the whole winter period regardless. I dont care if it rents for nothing in summer so long as someone is looking after it. There is some cheap ones on this site right now well worthy of consideration but i think something that has at least 9 rooms and is on or close to the shuttle bus line would suit me later this year as i want to be organised before 2011 season. I've just listed a few new places if you have a look on the site but unfortunately nothing in Akakura. There's a nice little cabin in Ikenotaira but whether it's big enough for everyone is a moot point. please hang around admin, you are both extremely helpful and very informative and when im next over there, ill be looking you up to take you out to dinner if your available. Im trying to get there later this year before winter as i think it would be useful to see these areas whilst its easy to drive around. The main shuttle run starts at the Akakura PO and follows the main to Ikenotaira, then onto Suginohara. I believe there are a few diversions depending on the the timing (there's no schedule listed on the website). Next year may be different depending on what happens with Suginohara (tipped to close without a new owner). You can see the Myoko Shuttle stops alongside the road so look out for those. The folk at the tourist centre could help you out with something more definite. I like the look of that cabin in Ikenotaira MG. Do you have any more info or a firm sort of location? ok all...its been awhile but im finally in position to do what i like cash wise and this is foremost in my mind. I think this kept me sane over the last 12 months actually. Im looking for one of two things. 1. either buy (or rent) a pension/house or similar and just go live it for the season. Im happy to buy it with others provided it fits us all in is about my only concern and i want it near a shuttle bus. 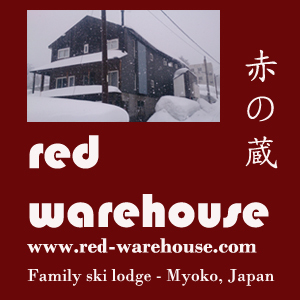 My partner and I are also thinking along your lines,we also arrive in Myoko on Jan 14th 2011.......will have to catch up and chat over a beer or three..will email you also.